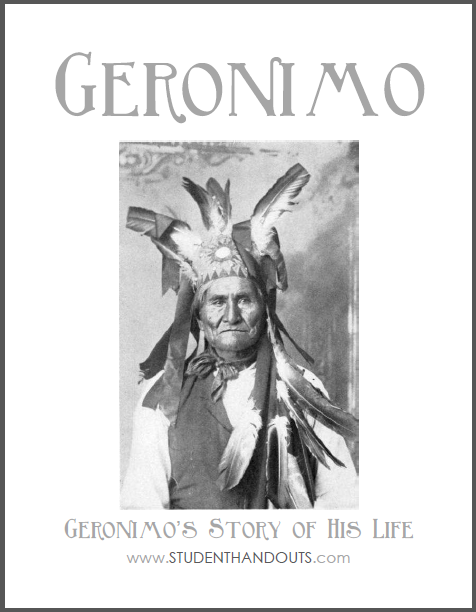 Geronimo's Story of His Life: Offered here is the complete text, including illustrations, from the autobiography of Geronimo, the famous war leader of the Apaches of Arizona. Embedded within the text are over 80 cross-curricular questions and activities covering English vocabulary acquisition, geography, history, and more. Teachers and students love our workbooks because they combine engaging tales with high-frequency questions which require close reading of the text. This workbook, part of our Biography Workbooks series, can be used with anyone from a struggling reader to an advanced student. Click here to print (85 pages; the answer key is below). 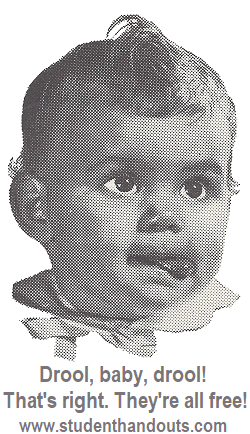 Click here to download or print the 76-page eBook without questions and activities (New York: Duffield & Company, 1906). Answer Key: 1. A - bonnet; 2. D - Fort Sill; 3. Theodore Roosevelt; 4. Answers will vary; 5. Asa Deklugie; 6. D - negative; 7. B - eagle; 8. C - evade; 9. In a cave; 10. Identify on map; 11. D - southwest; 12. Victoria; 13. B - False; 14. Bedonkohe, Chokonen, Chihenne, and Nedni; 15. B - False; 16. A - caverns; 17. C - retribution; 18. B - False; 19. A - bear; 20. D - taunted; 21. Kah; 22. D - wasting; 23. B - deer; 24. Mangus-Colorado; 25. Alope; 26. 3; 27. C - Mexico; 28. B - envisage; 29. It was forbidden; 30. B - label; 31. D - foresee; 32. Apaches; 33. A - True; 34. A - chose; 35. A - explore; 36. Answers will vary; 37. mountain lion; 38. Answers will vary; badly; 39. Answers will vary; 40. mescal; 41. Killed them, then dried and stored the meat; 42. B - contemptible; 43. C - hijack; 44. C - Skeleton Canyon, Arizona; 45. D - unhinged; 46. B - guardedly; 47. B - happening; 48. Answers will vary; 49. C - Nacori; 50. Chihuahua; 51. C - San Carlos Reservation; 52. Geronimo’s; 53. B - 1884; 54. D - surveyors; 55. A - Fort Bowie; 56. Answers will vary; it had disbanded; 57. Apache Tejo; 58. A - departed; 59. B - Howard; 60. A - corn; 61. Answers will vary; they didn’t trust the army; 62. General Crook; 63. Answers will vary; believed they’d asked U.S. troops to come to Mexico to fight the Apaches; 64. Answers will vary; he felt that promises were never kept; 65. C - Torre; 66. A - True; 67. A - Fort Marion; 68. Answers will vary; yes; 69. A - Captain Crawford; 70. A - capitulate; 71. A - True; 72. Answers will vary; no; 73. Mescalero, New Mexico; 74. Answers will vary; an account that contains a portion of the Apaches’ earnings; 75. No; 76. C - religious; 77. C - Eva; 78. D - St. Louis, Missouri; 79. Answers will vary; 80. D - senseless; 81. B - Christianity; 82. C - Kiowa; 83. A - Arizona; 84. Answers will vary.